The straight elevated stretch on the Amritsar-Jalandhar Road may tempt you to speed up your vehicle, but mind it the police have kept an eye on you. Following a rise in road accidents in the city over the last few days, the traffic police have stepped up stringent measures to regulate traffic. The Municipal Corporation today pressed its six-member team comprising senior officials to swiftly resolve the issues regarding civic amenities that have been raised by a team of Asian Development Bank (ADB) on the heritage walk. Taking cognizance of the rampant irregularities prevailing in the Birth and Death Certification Department, Right to Service Act Commissioner Dr Dalbir Singh Verka has issued instructions to the Municipal Corporation authorities to ensure time-bound delivery of birth and death certificates to the city residents. Spring season’s first shopping festival ‘Indo-Pak Spirit of Fashion’ will be organised on March 22-23 at MC International, Amritsar. The fourth edition of the event will bring numerous designers under one roof so that fashion folks of Amritsar and nearby areas can get a varied range of designer collection. Two persons have been booked in separate snatching incidents. In the first case, a motorcycle-borne youth snatched the earrings of a woman while she was on a stroll with her sister. In the second case, an unknown man snatched the purse of a tourist which contained Rs 20,000 and a mobile phone. The 33rd North Zone Orthopaedics Workshop and Conference was organised by Government Medical College (GMC) in collaboration with Amandeep Hospital, a private hospital, at the government run Guru Nanak Dev Hospital, here today. The District Transport Office (DTO) has opened additional counter for high security registration plates (HSRPs) on its premises. District Transport Officer, Dr Rajat Oberoi, said the facility had been extended to provide quick service to persons, who came with their own registration copies and identity proof. 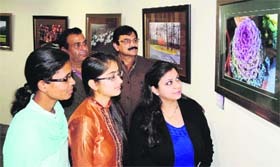 A solo show on landscapes by Dr PS Grover, a city- based chest specialist and a photo artist, is being held at the art gallery. Capturing nature with his lens, the artist has put on display 28 odd pictures from his huge personal collection. Punjabi film ‘Marriage da Garrage’ promises a fresh story and star cast. It also marks the debut of Navraj Hans, elder son of Hans Raj Hans, and Keeya Khanna, a Bollywood starlet. The romantic comedy has Upasna Singh, BN Sharma, Jaswinder Bhalla and Shakti Kapoor to add to its star power. Amritsar: A stencil printing competition was organised by the Department of Lifelong Learning at Guru Nanak Dev University here today. The contest is a part of series of talent search programme. As many as 31 students of textile designing, fashion technology and cutting and tailoring participated in the competition. The number of traffic cops manning the city vehicles has been increased from 150 to 300. They have been equipped with alcometers, night-vision batons and fluorescent jackets. Slip roads have been demarcated by affixing colourful barrier bars. The permissible speed limit on the elevated stretch of the Amritsar-Jalandhar Road for heavy vehicles such as buses and trucks is 50 km per hour whereas for light vehicles such as cars, it is 55 km per hour. For two-wheelers the speed limit is 35-45 km per hour here. Any person tested with alcohol exceeding 30 mg per 100 ml of blood on alcometer or being under the influence of drugs to an extent as to make him incapable of exercising proper control over the vehicle, is liable to be charged for impaired driving under Section 185 MVA-88. The punishment for the above said crime can extend up to 2 years imprisonment and/or fine up to Rs 3000. More significantly, the court convicting a person for the offence of alcohol/drug impaired driving may disqualify him from driving for a period of at least 6 months. The court may cancel his driving license in case he is again convicted for the same offence. Audio public address system has been introduced at two key roundabouts - Novelty Chowk and Sessions Chowk - wherein commuters are being made aware about traffic norms. Additional Deputy Commissioner of Police (Traffic) Shailender Singh Shally said steps had been initiated to regulate traffic and spread awareness among residents about traffic norms. “Traffic rules violation will not be tolerated at any cost now. We have bifurcated the city into four zones and have allocated the responsibility of regulating traffic to the concerned police beat in-charges. The audio public address system will also be set up at Maan Singh Chowk and 4S Chowk. We are in the process of procuring more breath analysers and speed governors to check drunken driving and over speeding. We have directed our staff not to come under any pressure and impose penalty on violators. If any of our staff members is caught indulging in any malpractice such as bribery or being negligent while performing his duties, he will face immediate action,” he said. 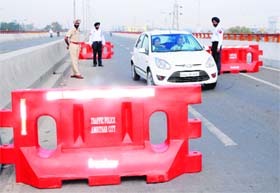 The focus was clearly visible on the main elevated stretch on the Amritsar-Jalandhar GT Road where for the first time, special kind of barricades have been placed. They are made of hard plastic and have been bordered with fluorescent tapes, which alert the driver from a considerable distance about their presence. These shining red coloured barricades have a hollow base but with a unique capacity of storing water to strengthen up its grip on the ground. “This water rack makes them heavy, otherwise they are very handy when empty and can be placed anywhere very easily. We have placed them at four points which are sensitive on the elevated road,” he said. The much awaited advance to fund basic amenities works for the heritage walk has run into rough weather. A visiting team of the ADB has placed a pre-requisite of getting the route of the walk free from dirt and garbage, before releasing the loan. Prompt reaction by the MC staff to the objections saved the situation from slipping out of hand. The six members were drawn from MC’s various wings like civil, water and sewerage, said MC Commissioner DPS Kharbanda. He said they submitted the report today and its recommendations suggested replacing three manhole covers, installing road cleaner on the route and three road gullies to be re-laid to prevent water stagnation. He said all these works would be done by Monday. 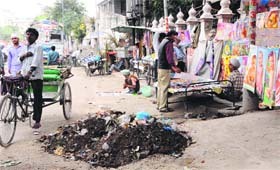 Besides, the report suggested deploying of six more safai sewaks on the route between 10 am to 3 pm. The commissioner said the MC staff performed the cleanliness work by 8 am but the walk will start two hours later at 10 am. However, people littered the nearly three km stretch of the walk with refuse again. Meanwhile, officials of the Punjab Heritage and Tourism Promotion Board (PHTPB) said plans to remove these blocks were being taken one by one and funds from the Asian Development Bank were being sourced to conserve precarious heritage value buildings and structures on the route of the heritage walk. The PHTPB is restoring many sites out of the 14 key heritage places on the route of the walk with the monetary assistance from the ADB. The board officials are busy designing the relook of these places. They have received no-objection certificates (NOCs) from the caretakers and owners of the places to be restored. One of the most significant heritage spots is a historic Gurdwara administered by the SGPC at Chaurasti Attari Chowk. The Gurdwara is associated with Guru Hargobind Sahib. In Punjabi, Attari means plinth or a higher place from the ground and it is believed that Guruji used to sit over there. The other is the SGPC run Saragarhi Gurdwara, which was built to mark the bravery of the Sikh regiment against the Afghans during the British rule. The board has also received the NOC to refurbish it. It has also got the approval to restore nearly 240-year-old Sangalwala Akhara, situated on the fringes of Golden Temple. A centre of Udasin cult, the akhara is considered a storehouse of Hindi religious literature written in the Gurmukhi script. It received the NOC from the Durgiana Committee to restore Thakurdwara Dariana Mal. Built during the reign of legendary Maharaja Ranjit Singh, the temple houses a Radha Krishan idol and is known for beautiful frescoes and finely engraved doors. Proprietor of the famous Jallebiyan Wala shop, Sanjeev Sharma, has given the NOC to refurbish the exterior of his shop. The popularity of the dessert earned the name for the intersection as Jallebiyan Wala Chowk. Besides, the area was once the hub of export houses supplying green tea, shawls and textiles to Central Asia. In-charge of the heritage walk, Harpreet Kaur Bhullar, said Darshani Deori located in Mai Sewan Da Bazaar had already been restored. Darshani Deori once offered the glimpse of Golden Temple to the people from the town. As a mark of respect, a small Gurdwara is situated at the place. Resplendent in murals and wall paintings, it still offers a fresh look. She said the patch of the road around Baba Bohar, an old banyan tree, standing in the middle of a narrow intersection, had been paved with tiles. She said an NGO being run by Baba Kulwant Singh from Ajnala had been given vital tools and equipment to clean the route of the walk and sensitise people. As per the Right to Service Act, the birth certificate has to be issued within a period of two days and the death certificate within five days, but this information was put on a worn-out board with non-functional phone numbers, serving little purpose of making people aware about their rights. Consequently, the applicants used to fall prey to middlemen and ended up paying unofficial payments to avoid the tedious official process. The birth and death certificate wing of the MC has been in the news in the recent past for wrong reasons, which included heavy kickbacks through middlemen, besides, the issuance of fake certificates. In a startling revelation around 10 days ago, it had come to light that birth and death certificates being issued from the MC office allegedly carried fake signatures. Nonetheless, Dr Dalbir Singh Verka, who paid a visit here, issued directions to MC Commissioner DPS Kharbanda to ensure proper implementation of norms and make the process transparent and efficient. Insiders said Verka was shocked to see the lacunae and tedious process being followed up at the department. The prime reason was that the computerisation of records had not yet started, due to which, officials could manipulate manual work for wrong reasons. He was astonished to observe that no official shared any responsibility for delay or any discrepancy while issuing certificates. He had issued directions to make the officials accountable at every stage so that disciplinary action could be initiated if any kind of negligence is found in performing duty. Just recently, a racket was busted by the newly appointed Superintendent, Shushant Bhatia, wherein at least 12 persons were virtually dragged out of the department’s premises. They were allegedly involved in facilitating applicants for getting certificates at a hefty price. It has been learnt that the applicants were ready to pay between Rs 1,000 to Rs 50,000 to get certificates. Sources said the birth certificates were being obtained to get undue benefits in getting admissions to educational or sports institutions whereas death certificates were being misutilised for obtaining financial gains through properties deals. MC Commissioner DPS Kharbanda said the process was being streamlined. “Our motto is to make the process simplified and transparent,” he said. Designers will be showcasing their creativity in the form of jewellery, handbags, high-end garments, ethnic wear, western wear, footwear and home décor. Designers from Pakistan will exhibit their collection of lawn fabric and thread hand-work embroidery suits. Hand-made Pakistani chapels will also be displayed in the fashion street - Spirit of Fashion. More than 50 stalls will be set up and they will be open till midnight. "As the designers from both the countries share the same platform to showcase their creativity, it helps us to strengthen the bond and give us an opportunity to increase trade between India and Pakistan," shared Sameeksha Khanna, organiser and fashion designer from the city. On the night shopping concept, Sameeksha said, "Since we had a large footfall during the evenings at our last event, we have extended the timings for a better shopping experience." Kanwaljit Kaur, a resident of Ek Roop Avenue, Majitha Road, said she was walking in the street with her younger sister Manjit, when a youth came on a motorcycle from behind. Before they could understand his intentions, he took out a sharp-edge weapon and forcibly took away her gold earrings. The accused also attacked her and tried to abduct her sister but was unsuccessful because of being spotted by passers-by. The investigating officer, ASI Prem Pal of Majitha Road police post, said the accused had been identified as Gurpreet Singh alias Gopi, a resident of Dolu Nangal village falling under the Beas police station, but he was still at large. “The incident had occurred on March 17 at about 8 pm and the complaint was lodged today. We have registered a case under Sections 323, 356, 354 and 506 of the IPC at the Sadar police station,” he said. In the second case, a visitor from Ahmedabad Alka Mabhijani said on March 20, when she was on her way from Hall Gate to the railway station on a rickshaw, a person came on a motorcycle and sped away snatching her bag having Rs 20,000, some important documents and a Micromax mobile phone. ASI Sukhdev Singh of E Divison police station said the accused was still unidentified but a case under Section 382 of the IPC had been registered. Many budding surgeons learnt new techniques and got hands on exposure to various orthopaedic conditions at the workshop. Dr HS Sohal, Prof and Head of the Department of Orthopaedics and the organising secretary of the conference said the workshop was held to train various delegates in arthroscopic surgical techniques i.e. key-hole surgeries and periarticular fractures i.e. the fractures around the joints, which were most difficult to treat. Dr Avtar Singh, chief orthopaedic surgeon of Amandeep Hospital, said high velocity accidents and other factors such as sedentary life style, rich food and age related deterioration, orthopaedics problem were on the rise. There was an increasing need for orthopaedic help and care, he added. Dr IPS Oberoi and Dr Kalpesh Trivedi performed live arthroscopic surgeries during the workshop. Dr John T John, Dr Harpal Selhi, Dr Avtar Singh and Dr Anant Mahapatra educated the delegates about periarticular fractures on bone models. The faculty shared their experience and expertise with the participants. Today's workshop would be followed by a two-day academic session conference at Raddison Blu Hotel. More than 300 delegates from across the country would be interacting at the conference to sharpen their skills and knowledge, said Dr HS Sohal. Postgraduate students from various medical colleges in the North zone, including Government Medical College Patiala, Adesh Medical College Bathinda, Guru Ram Dass Hospital, Gram Sagar Medical College, Banur, PGI Chandigarh, Indira Gandhi Medical College, Shimla, were familiarised with new techniques, experiences and expertise in the field of orthopaedics. "More than 4,000 orthopaedics related surgeries are done annually at the government run Guru Nanak Dev Hospital," said Dr HS Sohal in an interaction with the mediapersons. Besides learning and practising on medical models, students also competed for securing a place in a shortlist of 22 best papers and 40 best poster categories. Prizes were given away to winners. A general counter was already functioning from the Distict Transport Office premises in addition to the above counter. The new counter will be available for two wheelers on Monday and Tuesday, for four wheelers on Wednesday and Thursday and for women on Friday. Vehicles must be registered in the name of women in order to make them avail the facility. The Transport Office also held a traffic rules awareness seminar at Ryan International School. District Transport Officer Rajat Oberoi in his address to the students made them aware about various traffic norms. He urged them to abide by rules to ensure safety on roads. The exhibition titled ‘Blissful nature’ has shots of everything that attracted Grover during his travel experiences. “I am fascinated by clouds, mountains and sea. Observing clouds dancing before the sun or flying above hills or reflecting in waters is my passion. A few close ups of flowers, plants and trees add variety. Each photograph shows happy moods of nature. That is why I have titled my exhibition ‘Blissful nature’,” shared Grover. The artist in him believes that every eye catching moment in life is meant to be captured. “Today everyone has a camera in his/her smartphone. One must click a perfect awe inspiring moment, which can be cherished for life. Events are there to be captured. You should have the knack to capture them,” said Grover. A Rotarian and pursuing his hobbies like singing, Grover’s passion remains as a photographer. “It always brings peace to me. It’s my first show and I hope people will like my clicks,” added Grover. Punjabi film ‘Marriage da Garrage’ promises a fresh story and star cast. It also marks the debut of Navraj Hans, elder son of Hans Raj Hans, and Keeya Khanna, a Bollywood starlet. The romantic comedy has Upasna Singh, BN Sharma, Jaswinder Bhalla and Shakti Kapoor to add to its star power. The actors and director of the film, who were in the city on a promotional tour, interacted with media and fans. Produced by 30 TY Group, directed by Jaswinder Singh, the film presents a comic story, but with a fresh approach. “The film revolves around two cons played by Jaswinder Bhalla and BN Sharma, who open a marriage bureau after coming out of prison. Enter, the lead pair of Navraj and Keeya, who are helped by these two con men to get married,” shared Jaswinder. Navraj, who will now be joining younger sibling Yuvraj as an actor, seemed excited about his debut. “I signed up for the film as it had interesting story and well known star cast. It is a family film and will definitely entertain the audience. I have also sung two songs for the film,” said Navraj. The film will release on March 28. It will also mark the debut of Bollywood baddies Razzak Khan and Shakti Kapoor in Punjabi films. Prof Gurpreet Kaur, director of the department, presided over the function. Sharandeep Kaur, Daljeet Kaur and Monica from textile designing won the first, second and third prizes respectively in the competition. Gurjeet Kaur from fashion technology and Navneet Kaur from textile designing were awarded the first and second consolation prizes, respectively. Aswind from the Department of Architecture, Rubina Sayal and Gursharan Kaur adjudged the participants. While addressing the students, Prof Gurpreet Kaur said the students have shown lot of enthusiasm and self confidence during the last three days. She said in future these students could become self reliant if they improved their art, which was the main objective of this department. Tejpal Kaur, Deepika, Ramanjit Kaur, Nidhi Sharma and Paramjit Kaur were also present on that occasion. A UGC sponsored national seminar on changing spectrum of human settlements and planning education was organised by Guru Ramdas School of Planning of Guru Nanak Dev University. The theme covered a wide range of relevant sub-topics as urbanisation, regionalism, infrastructure planning, participatory approaches and contemporary challenges in planning education. Delegates from across the country, including Haryana, Himachal Pradesh, Madhya Pradesh, Delhi, Maharashtra, Jammu and Kashmir, Karnataka, Andhra Pradesh, West Bengal and Punjab attended the seminar. Dev University, presided over the session. Dr DS Meshram, former president of the ITPI and visiting professor at University of Mysore delivered the key-note address. The seminar began with Dr Ashwani Luthra’s address wherein he threw light on the emerging challenges in global urban centres and the imperatives for planners to seek new options for the development of human settlements. He also emphasised that Guru Ramdas School of Planning should strive to become a think tank for providing viable solutions to problems related to planning. In his address, Dr DS Meshram, took up the issue of shortage of trained manpower for planning urban and rural settlements and assessed the requirement of planners to plan these settlements. He also identified issues and imperatives for increasing the number of students in the planning stream, developing education structure and faculty. He said as per the statistics of the Ministry of Human Resource Development, as many as 1,60,000 town planners would be required by 2031. In his presidential remarks, Prof Brar emphasised upon promoting interactive discussions and creative thinking amongst the students. He also pointed out the need of imparting sound theoretical knowledge coupled with practical interventions in order to meet the current and future challenges of planning urban and rural settlements in the country. A team of senior doctors from the Civil Hospital monitored blood donation at the camp. The team lauded the motivation of students for their enthusiastic contribution in organising this camp. Chairman of the institute, Dr BS Chandi, while applauding the donors, said everyone should donate blood as it replicated human values and social responsibility towards society. Vice-chairman of the institute, Dr Akashdeep Singh, supervised arrangements at the camp.